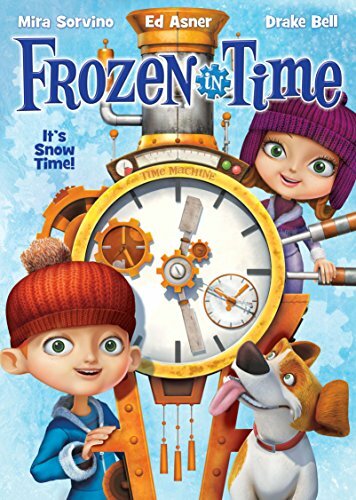 ARC Entertainment is releasing Frozen in Time on DVD on November 11, 2014. Cast: Ed Asner (Up), Mira Sorvino (Romy and Michelle's High School Reunion), Drake Bell (Nickelodeon's "Drake and Josh," The Naughty List). Synopsis: Young siblings Eric and Patty are about to take off on a thrilling, and chilling, adventure! After damaging their grandfather's most treasured possession, a strange clock, they throw the whole world into a crazy time continuum, where Christmas day is repeated over and over. The only way they can restore order is to travel to the North Pole and repair the clock in Santa's workshop. With less than a day to go, Eric, Patty, and Grandfather frantically zip off to the frozen wonderland. All they have to do is figure out the complicated solution, carefully mend the clock, and get back home in time to fix Christmas!